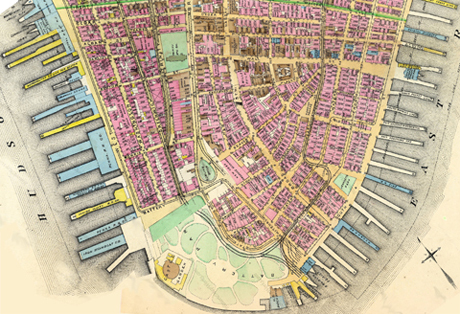 This is the first map to show all NY lots & buildings. Precursor of the fire maps first published by Perris in 1852, later by Sanborn and Bromley. 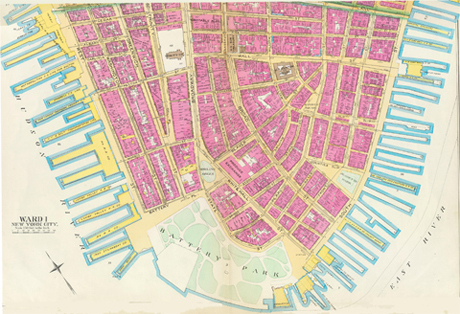 The six maps reproduced here, showing lower Manhattan streets, blocks, and waterfront piers for the dates 1852, 1879, 1885, 1891, 1911, and 1927, were laboriously downloaded and tiled from a series of separate plates of commercial fire insurance maps. 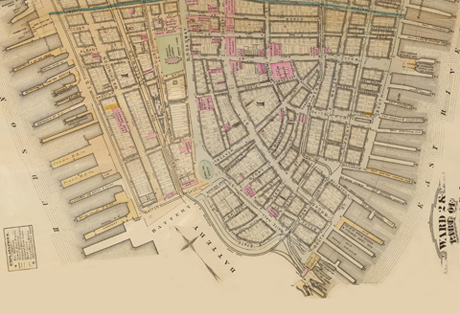 The original maps are in the collections of The David Rumsey Historical Map Collection, The New York Public Library Map Collection, and The Historic Map Works, Residential Genealogy Collection. 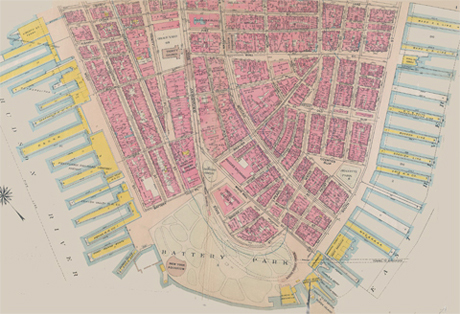 Historic fire insurance maps are extremely useful to urban historians, as they identify not just the pattern of streets and blocks, but the precise lot or building dimensions, outline, and lot coverage; height in stories; street and sidewalk widths; addresses and the City's block and lot numbers that are used for building permits, tax records, and other municipal purposes. Hand colored lithographed map. Maps in the atlas show buildings, fire hydrants, steam and street railways, original water courses, original farm lines, ward boundaries, water mains, block dimensions, etc. Covers the Financial District. Includes Fulton Market, fish market, Wall Street Ferry, South Ferry, Custom House, Court House and Hanover Square. Includes annotations. Plates 1-2 Atlas of the city of New York: embracing all territory within its corporate limits from official records, private plans & actual surveys, by and under the supervision of E. Robinson & R.H. Pidgeon, civil engineers. drawn by Bromley, George Washington; Bromley, Walter Scott; David Rumsey Historical Map Collection; Lithographed map, Plate 1. Hand col. Covers Financial District area south of Liberty St. including Battery Park, Trinity Church and U.S. Custom House. Shows buildings with construction materials, number of stories, house number and use or occupant; water mains with size, sewers, old farm lines with owner names, old water courses, block dimensions, street widths, lot numbers and dimensions, spot heights and block numbers, wharves, etc. Plate 1, Atlas of the city of New York, borough of Manhattan, drawn from actual surveys and official plans by George W. and Walter S. Bromley. Published by G.W. Bromley and Co. New York; Plates 1, 2, 3, 4, 39, & 40 From the Land Book of the Borough of Manhattan City of New York. 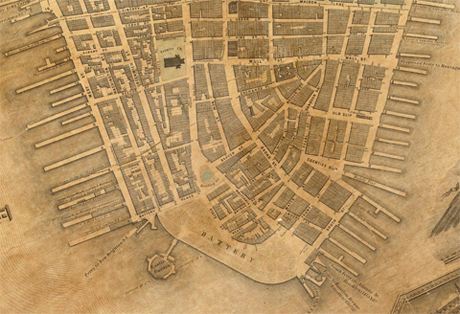 The business of fire insurance maps originated in London in the late 1700s to help insurance underwriters better understand risk. These maps did not develop in the United States until the mid-1800s. Most American fire insurance companies were small and based in a single city, so underwriters could examine directly the properties they insured. New York City's Great Fire of 1835 caused losses of more than 20 million dollars and bankrupted many smaller insurance companies. 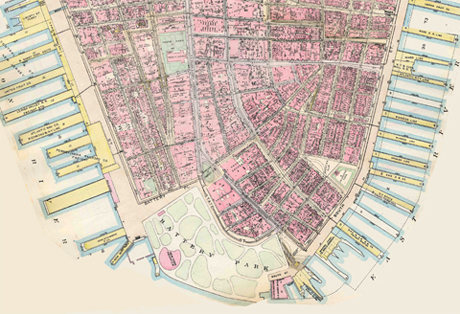 When the industry reorganized and became more regulated, larger companies formed and the demand for maps giving essential risk information for cities across the nation developed.